In recent years, Australia has seen a considerable surge in the development of community-based Child Care Centres and here at Neylan, we’ve had the pleasure of being involved in the development of several of these new and exciting centres. These projects have brought with them many opportunities for new centre typologies and arrangements, with each project required to cater to the unique needs of children ranging from baby to school age. In addition to stand-alone Greenfield sites scattered throughout suburbia, we have also had several interesting commissions for a new building embedded within an existing commercial centre, offering unique interactions between existing retail, medical, office and community facilities and the proposed early learning centres. 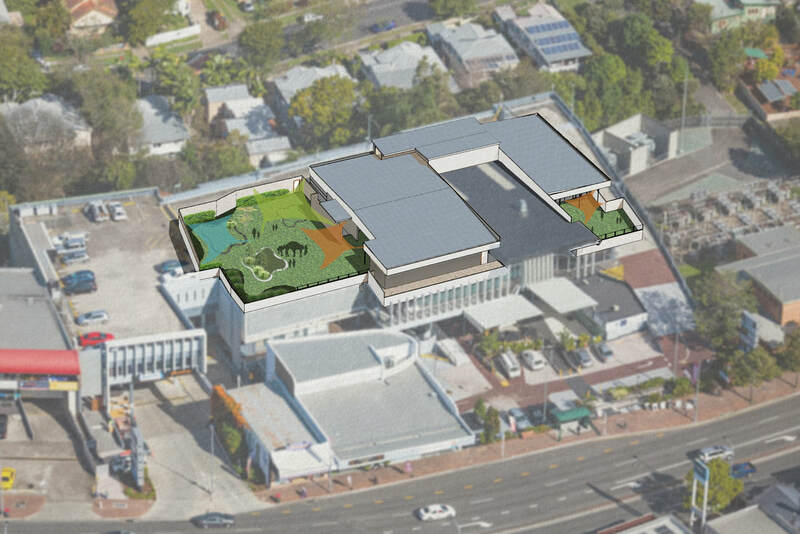 One of our exciting new projects - a 113 place childcare centre nestled in an existing shopping centre on the Gold Coast’s North – is currently nearing completion and is set to open this year. This new learning environment is perched one level above the existing commercial facilities which are also set to expand as part of the project. This model for a new densified mixed use development is enhanced with an interesting linking plaza between the commercial and early childhood zones. Here, parents and children access the elevated facility via a communal landscaped ramp that offers a friendly transition to the upper level and plenty of opportunities to linger, play or explore. The journey is punctuated by several playful sculptures commissioned from a collective of local urban artists to enhance this urban plaza. Planning is also underway for a new and exciting learning space for 90 children in Underwood. Central green courtyards and perimeter play spaces create an inviting place for students to learn and play. Spaces have been arranged to minimise the amount of circulation space and to allow an easy transition between spaces. The centre's classrooms and play spaces allow children and teachers to freely move from place to place, whilst providing an opportunity for constant supervision through the orientation of rooms. The centre will provide children with a wide range of sensory experiences and provide them with a safe place to play and learn. These new facilities will be an asset to the surrounding area and the broader community with this colourful and leafy new centre set to open next year.